Empowerment comes when people gain control over a significant piece of their life and this becomes a vehicle to realizing entitlement to control and power in other areas. Since cooperatives are owned and democratically controlled by their members, empowerment is integral to membership. Yolo Eco-Clean Cooperative (YECC—pronounced “yes”) was created to develop sustainable, living wage jobs and cooperative ownership opportunities for underserved community members and to create a regional business that contributes to the local economy. The co-op provides “green” or environmentally friendly residential and commercial cleaning services that are good for the environment, workers and clients! YECC was formed using the “build and recruit” model of cooperative development. In this model, pre-development and early launch decisions are made by a steering committee and a temporary board composed of local community members. 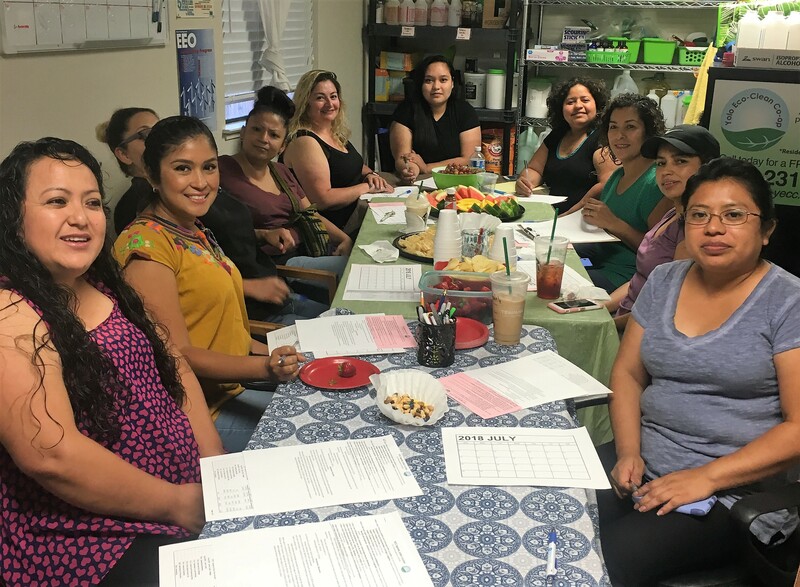 Community volunteers relinquish their role as temporary board member as worker members complete their membership candidacy and join the board. The co-op has the capacity to provide opportunities to more members as the business grows. YECC launched with 4 members who worked part time and has grown to more than 12 members with full time hours. Before submitting an application to work with the co-op, prospective members complete four workshops that focus on worker cooperatives: Co-ops 101, Governance and Decision-Making, Understanding Finances and Bylaws of Yolo Eco-Clean Cooperative. Classes are conducted in Spanish and English. Following an interview, individuals begin paid work as “member candidates” which includes ongoing training in green cleaning. Member candidates are encouraged to participate in all member meetings and work for the cooperative for six months before they are eligible for membership. During this time, they, and all members, undergo regular peer evaluations. Using information from the evaluations, and their personal evaluations, new members are accepted following a 2/3s affirmative vote of board members. The “Bahati Mamas” formed a farming cooperative as part of a joint project between the International Rescue Committee (IRC) in San Diego and CCCD. The original eight members emigrated to the US from Somalia after spending years in refugee camps. Today they farm land shared with another worker cooperative in San Diego. The women operate their business together, which includes growing row crops, transporting and selling them to restaurants and at farmers markets, and cooperatively sharing the benefits from their enterprise. Through the cooperative, each Bahati Mama contributes to her family income and realizes independence in her new country.